And finally...I completed my first full marathon. Aug 30 2009, the day I'll remember forever. It's been almost three months ever since I started running and have always been dreaming to complete a marathon. I am glad I did it. Mixed feelings when I crossed the finish line. Wish I could translate my feelings into words. 42.2 Kms seemed so long and endless. Ram and I left Chennai by train to Hyderabad. After a hectic week at work, it was so good and exciting to be out on a trip. I was so tired. Had an early dinner and hit the berth. All I could remember was being woken up by Ram once we reached Secunderabad. After settling down at our friend's place, we went for a run at Necklace Road. It was very pretty. 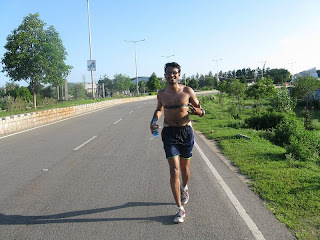 We were running by the Hussain Sagar lake for about 6kms. 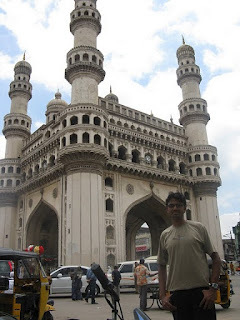 Later in the noon we went out for sight seeing and Charminar was the first destination, obviously. Later, Paani poori and Samosa and Gokul chat. Yummy! We then went to collect our BIB and Kit. '21' - that was my BIB number. It felt so good. Later we went to watch Kaminey that night along with other friends and then hit the bed. Got up at 4:00 in the morning and reached the race spot by 4:45. It was a very thrilling moment. To see so many people to run the race. I am not alone in this madness. After our stretching exercise, I was all set to hit the start line. Full Marathon was flagged off at 5:30AM and the race officially started. This is it. No turning back. Run Naresh Run!! The first few miles felt nothing. The arrangements were very good. Police were holding the city traffic everywhere. The weather was just perfect until Sun started showing up. I was expecting the race to be on a flat course but I was wrong. We also had to run through many loops which was kind of a let down. I was feeling like giving up when I crossed the Half Marathon finish line. Volunteers were suggesting that I can complete my race if I wish. Those words were all the more tempting but I kept running. I made a promised to myself that I complete this marathon, no matter what, at any cost. The weather was killing and I was drowning in my own sweat. Wish I had my Ipod with me. So lonely, so painful yet so good. I was focused on just one thing. To cross the finish line and get my finisher medal. The milestone read 40kms. 2.2 Kms to complete the race. 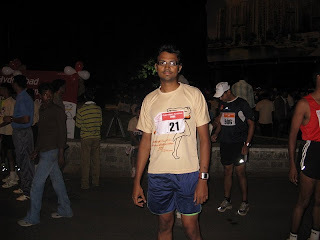 The last stretch of the race, we had to run inside the Gachibowli stadium track. It's almost over. Photographers were clicking shots, a huge crowd standing by to cheer, All my pain vanished at that very moment. Hit the finish line and received my Medal and Certificate. It's over. w00t. I was glad and proud that I finished my first full marathon in 5:45. A very good beginning to my running expedition. Indeed. When i passed the last water station before crossing the road and entering the complex, i overheard the volunteer receiving information that there was one more person on the course and would be coming up shortly. When i crossed the finish line, (Rajesh Vetcha) and a couple of them enquired and i told them that i believe there is another guy around, not too far away hopefully. I was thinking then of who it could be, and i think i did recollect which runner it was. We exchanged waves a few times. Now when i read this, i wonder if we met on the course. While i don't remember for sure (i was too dogged down then! ), i think we must have. 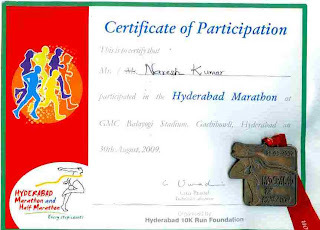 And dude, check this - Hyd was my 1st marathon too and i finished around the same time (5:42). Small world indeed hah!